Teachers build professional skills and advance their careers by enrolling in a master of K–12 education program. The degree emphasizes educational theory and practice, which prepares graduates to work as a K–12 teacher or in school administration. A master’s degree allows graduates to apply for principal positions, which is a lucrative opportunity for teachers. According to the Bureau of Labor Statistics, K–12 principals earn over $94,000 a year on average. Earning a master’s degree also qualifies teachers for licensure and a salary increase in many school districts. 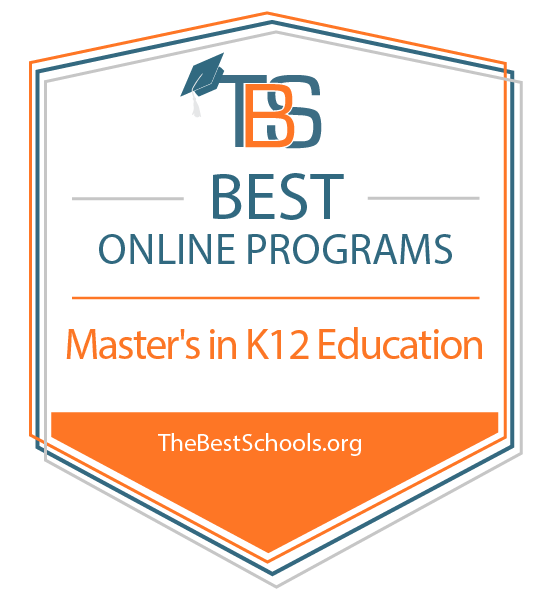 What Else Can I Expect From an Online Master’s in K–12 Education Program? We selected the following degree programs based on the quality of program and range of courses provided, as well as school awards, rankings, and reputation. Styling itself as North Carolina’s leader in online education, ECU enrolls tens of thousands of students in over 90 online programs every year. Many of these students work full time, with most distance learners never setting foot on campus in Greenville. ECU offers master of K–12 education programs in art, mathematics, reading, science, physical education, and special education. Though each program includes differences, they all share certain commonalities such as multiple start dates per year, asynchronous coursework, and no required campus visits. These programs do not list a minimum GPA threshold, but they do require GRE or MAT scores. ECU is regionally accredited by the Southern Association of Colleges and Schools Commission on Colleges (SACSCOC). One of the best state universities in the nation, UGA leverages its significant resources to offer several of its programs through distance learning, including one of the university’s master of K–12 education programs — an M.Ed. in middle grades education. Aiming for flexibility, the 36-credit program delivers coursework asynchronously through a degree plan that allows students to graduate in two years by taking two courses each semester. UGA partners with Clarke County Schools to offer advising and student teaching placement. The program allows transfer students to bring up to nine credits with them. Students do not need to submit GRE scores and can apply for rolling admission for the fall, spring, and summer terms. The program does not list a minimum GPA threshold for applicants. UGA is regionally accredited by the Southern Association of Colleges and Schools Commission on Colleges (SACSCOC). One of the Palmetto State’s two flagship universities, Clemson University maintains seven different colleges which offer courses in fields such as forestry, engineering, arts and sciences, and education. The university’s Clemson Anywhere platform makes some of the school’s strongest programs — including the M.Ed. in teaching and learning — accessible to distance learners worldwide. Students choose a specialization in instructional coaching, STEAM, or experiential learning for early childhood, completing the program by taking two courses each semester for five semesters. The M.Ed. program delivers coursework asynchronously, never requires students to visit campus, and allows future teachers to graduate within 18 months. The program requires a 3.0 undergraduate GPA or a top 50th percentile GRE or MAT score from all applicants. Students can work at K–12 education jobs upon graduation. Clemson is regionally accredited by the Southern Association of Colleges and Schools Commission on Colleges (SACSCOC). Located in College Station, Texas A&M counts itself among the Lone Star State’s flagship universities. The school expanded its slate of distance learning programs in recent years and now offers an online master of K–12 education program focused on curriculum and instruction. The program requires students to complete 36 credits, a process that usually takes two years of full-time study. The program’s curriculum does not include a thesis, instead focusing on courses that develop foundational research, theory, and methodology. Students also develop expertise in a specific content area, ideally in the space within which they plan to teach. The program delivers coursework asynchronously and does not include on-campus requirements. Students may apply for admission in the fall and spring semesters. Texas A&M is regionally accredited by the Southern Association of Colleges and Schools Commission on Colleges (SACSCOC). Based in East Lansing, Michigan State is one of the state’s flagship universities. Serving students in all 83 counties, the school grew into one of the nation’s leading distance learning schools in recent years, enrolling over 30,000 students in 136 online or blended-learning programs. Michigan State’s online master of K–12 education program boasts over 900 graduates. The program provides flexibility for current educators, delivering coursework asynchronously and never requiring students to visit campus. Students can choose a concentration in special education, sport coaching and leadership, technology and learning, literacy education, science and math education, or P-12 school and postsecondary leadership. No matter their concentration, students complete core courses such as the psychology of learning and electronic assessment. The 30-credit curriculum usually takes two years to complete. Michigan State is regionally accredited by the Higher Learning Commission (HLC). The Palmetto State’s flagship university, USC operates a central campus in Columbia and seven satellite centers throughout South Carolina. The university also offers several distance learning programs, including an online M.Ed. in teaching. Students who enroll in this master of K–12 education program choose one of three concentrations: literacy and reading, project based learning, or multicultural contexts in education. No matter their concentration, students complete a set of core courses that include studies in professionalism, ideas and issues, and research. Students must also complete a research seminar as a capstone. The 30-credit curriculum usually takes two years to complete. Each online course in the program lasts eight weeks, delivers coursework asynchronously, and does not require students to visit campus. South Carolina is regionally accredited by the Southern Association of Colleges and Schools Commission on Colleges (SACSCOC). Located in Longview, Texas, LeTourneau University provides interdenominational, Christian-centric programs in business, education, aeronautics, and engineering to students around the country. The university offers several programs designed specifically for working professionals at regional centers in Dallas and Houston. LeTourneau also offers several of these degrees online, including the online master’s in K–12 education program. In order to earn the degree, students must first complete 36 credits, a process that usually takes six semesters, or two years. Focusing specifically on secondary school, the program includes both a clinical teaching experience and an internship in addition to core coursework in public school law, instructional leadership, literacy instruction, and differentiated instruction. LeTourneau delivers all online coursework asynchronously and never requires online students to visit campus. LeTourneau is regionally accredited by the Southern Association of Colleges and Schools Commission on Colleges (SACSCOC). One of the oldest universities in the country, the University of Pittsburgh opened its doors just after the American Revolution. In recent years, Pitt expanded into the distance education space and now offers three different online master’s in K–12 education programs: English and communications, mathematics education, and secondary social studies education. Each program combines foundational teaching coursework with area-specific classes. The programs deliver all coursework asynchronously and do not require students to visit campus for any reason. Each program requires 36 credits, which usually takes two years to complete, and each program prefers applicants with a minimum GPA of 3.0. All three programs accept students for the fall, spring, and summer semesters. Pitt is regionally accredited by the Middle States Commission on Higher Education. Located in Lynchburg, Virginia, Liberty University counts itself among the largest Christian universities in the world. The school also enrolls more distance learners than almost any other school, with nearly 100,000 students worldwide — including 30,000 military students. Liberty’s online master of K–12 education program requires students to complete 36 credits in order to graduate, a process that usually takes 18 months. The program offers flexibility by allowing transfer students to apply up to 18 previously earned credits. It also enables students to complete all coursework asynchronously. Students may, however, complete optional on-campus intensives in Lynchburg if they wish. The program also offers up to six start dates throughout the year, accepting applications on a rolling basis. One of Indiana’s preeminent state universities, Ball State enjoys nationwide renown for its doctoral research degrees. The school continues to focus on programs for working professionals, offering evening classes at its central campus in Muncie, its satellite centers in Indianapolis and Fishers, and online. Ball State now offers its master’s in K–12 mathematics education online and without in-person requirements. This master of K–12 education program also delivers coursework asynchronously, allowing working professionals to complete assignments at their convenience. The 30- to 32-credit curriculum offers different tracks for elementary/middle and secondary school teachers, and students can typically earn their degrees within two to three years. Each track includes both content knowledge and research-based core coursework. The program meets the standards outlined by the National Council of Teachers of Mathematics. Located on the Charles River in metropolitan Boston, BU serves students far beyond the borders of the Massachusetts through its slate of distance learning offerings. These offerings include an online master of K–12 education program, which focuses specifically on curriculum and teaching. Catering to in-service teachers, the program allows educators to work full time while still taking courses to further their careers. The program accomplishes this goal through asynchronous coursework and no in-person requirements. Most educators complete the 36-credit curriculum over the course of two years of part-time study. The typical student takes only one course during each 14-week semester, including the summer semester. The program accepts students on a rolling basis, admitting them for the spring, summer, and fall semesters. The program also offers a wide variety of content specializations, including elementary education, English, ESL, math, social studies, science, and special education. Based just outside of Atlanta in the city of Kennesaw, KSU enrolled over 36,000 students in the fall of 2018, making it one of the largest universities in the U.S. Some of those 36,000 students enroll in KSU’s distance learning programs, which includes two online master of K–12 education programs: middle grades education and secondary education. While the secondary education program offers concentrations in English, mathematics, and history, the middle grades program provides concentrations in language arts, social studies, and mathematics. Aside from that difference, the two programs share many similarities: each requires 36 credits (or 18–24 months), each delivers coursework asynchronously, and each eliminates in-person requirements for online students. KSU is regionally accredited by the Southern Association of Colleges and Schools Commission on Colleges (SACSCOC). Both master’s programs are also nationally accredited by the National Council for Accreditation of Teacher Education. Located in Warrensburg, the University of Central Missouri enrolled over 12,000 students from 43 different states and 60 different countries. UCMO maintains a smaller online presence, enrolling approximately 950 graduate students in distance learning programs, including several in the school’s online master of arts in teaching program. This master of K–12 education program boasts an 86% placement rate for its graduates. The program offers flexibility, delivering all of its coursework asynchronously and without in-person requirements. The program also provides concentrations in over 20 different content areas, including art, earth science, English, foreign language, and physical education. Students can choose between a middle grades or secondary education focus in all of these content areas. UCMO is regionally accredited by the Higher Learning Commission (HLC). With its central campus in Statesboro, Georgia Southern University enrolls more students than any other school in the southern part of the Peach State. In addition to its main campus, Georgia Southern operates centers in Savannah, Hinesville, and online. The university offers multiple master of K–12 education programs online, including degrees in elementary education, middle grades education, and secondary education. All of these master’s programs share certain features: each requires 36 credits, takes 18–24 months to complete, delivers coursework asynchronously, and requires applicants to submit evidence of a minimum 2.5 GPA in all previous coursework. In addition, none of these programs include in-person requirements in their curricula. The middle grades and secondary education programs offer content area endorsements in standard fields, such as mathematics, English, and science. Operating a central campus in Searcy, Arkansas, Harding enrolls more students than any other private college in the Natural State. Affiliated with the Church of Christ, Harding spreads the gospel by operating satellite centers worldwide in countries such as England, Australia, Chile, Greece, Italy, and Zambia. The university also offers several of its degrees online, including two online master of K–12 education programs. The school offers both elementary and secondary education master’s degrees, each of which requires students to earn 35 credits, which usually take one to two years to finish. Both programs require students to pass comprehensive examinations in order to graduate. Both curricula require a mandatory course in Christian ethics in education in addition to core courses in school policy and research methods. Prospective students must already possess a valid teacher’s license in order to earn admission to the program. Harding is regionally accredited by the Higher Learning Commission (HLC). Formerly known as Villa Julie College, the current iteration of Stevenson University came into existence in 2008. The Baltimore County School began to expand its distance learning presence around the same time and now offers a master of K–12 education program online. Focusing primarily on STEM education, the program prepares graduates for initial Maryland teaching licensure in physical science, mathematics, physics, earth/space science, chemistry, and biology. The program runs on a cohort model, allowing students to progress through the same set of courses — which last for eight weeks each — with the same group of peers. Stevenson delivers all program coursework asynchronously and does not require online students to visit campus for any reason. The program’s 33-credit curriculum usually takes 18–24 months to complete. Admission requires a minimum 3.0 GPA and qualifying scores on the GRE, PRAXIS I, SAT, or ACT. Stevenson is regionally accredited by the Middle States Commission on Higher Education. A Baptist-affiliated university based out of Plainview, Texas, WBU maintains an additional 13 campuses across the Lone Star State, Alaska, Hawaii, Oklahoma, New Mexico, Arizona, and Kenya. As such, the university caters to a geographically diverse set of students. WBU’s distance learning programs help further that mission. The school offers a master of K–12 education program that aims for flexibility, convenience, and efficiency, allowing students to graduate within 18 months without ever needing to visit any of its campuses. Additionally, the program delivers all online coursework asynchronously, making coursework more manageable for working professionals. WBU offers a tuition discount to students who only take online courses and a further discount to active duty military members. Located in Starkville, Mississippi State is one of the Magnolia State’s two flagship universities. The school enrolls over 22,000 students, including many students who take only online courses. The university now offers an alternative master of K–12 education program for students who did not major in education during their undergraduate studies and need their initial teaching licensure. The program delivers coursework asynchronously and never requires students to visit campus for any reason, as they can set up placement sites for their internship and student teaching in their own communities. The program allows students to become certified in grades seven through 12 in physics, English, math, social studies, chemistry, or biology. Students can also get certified in grades K–12 for physical education. All students who scored at least a 21 on the ACT earn an exemption from the Praxis Core exam. Mississippi State is regionally accredited by the Southern Association of Colleges and Schools Commission on Colleges (SACSCOC). A Methodist-affiliated liberal arts school based in Saint Paul, Minnesota, Hamline University focuses on social justice through service and experiential learning. To that end, the school currently requires all students to complete an internship or some sort of field or direct experience. The university’s background influences its online master of K–12 education program, which requires students to visit campus for certain on-campus experiences. Now 20 years old, the program maintains Hamline’s policy by requiring future teachers to complete internships and student teaching in the classroom for credit. Nevertheless, Hamline still provides flexibility in its online offerings. The program accepts students in the fall, spring, and summer terms and allows transfer students to apply up t five previously earned credits. The 34-credit curriculum usually takes students between 18 and 24 months to finish. Hamline is regionally accredited by the Higher Learning Commission (HLC). A public university based in California, Pennsylvania, Cal U made an effort to expand its distance education offerings in recent years as its student population grew. As a result, the university now offers three different online master of K–12 education programs: secondary special education, elementary and middle grades special education, and STEM education. Programs run on a cohort model, providing each student with a peer group with whom they complete the same course sequence. The three programs deliver all courses asynchronously, with students frequently taking two courses per semester and graduating in five semesters. As such, many of the programs' students teach full time in schools and complete their assignments at their convenience. All three programs provide one-on-one academic and career advising to each student. Based in Springfield, Missouri State enrolls over 21,000 total students. Many of those students enroll in one of the school’s distance learning degree offerings, including its online master of K–12 education program, which allows graduates to earn a degree in elementary education. All students in the elementary education program choose a content area specialization, picking from fields like special education, reading, early childhood education, or middle grades education. The program’s 27-credit curriculum allows students to graduate in five semesters of part-time study. The school aims to allow in-service teachers to enroll in the program by delivering all online coursework asynchronously. The program does not list minimum GPA or GRE requirements for admission. Located in Natchitoches, Northwestern State University of Louisiana (NSULA) offered business and nursing programs before any other university in Louisiana. NSULA now offers a slate of online programs at the associate, bachelor’s, master’s, and doctoral level. The school offers seven master of K–12 education programs: early childhood education, elementary education, middle grades education, secondary education, elementary special education, middle grades special education, and secondary special education. Though the programs include individual qualities, they all share certain elements. First, all seven programs require between 33 and 39 credits, meaning that they all take around two years to complete. Second, they all deliver coursework asynchronously and do not require students to visit campus. Third, they all require students to pass the PRAXIS II in their content area before proceeding to the internship requirement of the program. NSULA is regionally accredited by the Southern Association of Colleges and Schools Commission on Colleges (SACSCOC). A private, Methodist-affiliated university located in Baldwin City, Kansas, Baker operates two schools: a college of education and a college of arts and sciences. The school offers graduate education/teacher preparation programs and professional programs that target working professionals through six satellite campuses located throughout Kansas and Missouri. As such, online education extends the university’s mission, and Baker now offers its master of K–12 education program online. The online M.Ed. program requires students to complete 36 credits, a process that usually takes two years. Students choose a concentration in student diversity, teacher of distinction, instructional technology, or curriculum and instruction. The program runs on a cohort model — in which students complete the same sequence of coursework with the same peer group — and offers multiple start dates each semester. Baker delivers all online coursework asynchronously. The program turned 20 years old in 2015 and as of 2018 boasted 120 different graduated cohorts. Baker is regionally accredited by the Higher Learning Commission (HLC). Southeast Missouri State University (SEMO) boasts a long history of strength in teacher education. That tradition continues to the present day, as the Cape Girardeau school now offers its master of K–12 education programs to students around the country through distance education. Online learners can pursue a master of arts in teaching, a master’s in elementary education, and a master’s in secondary education through SEMO. Each program requires students to complete at least 30 credits, a process that usually takes 18–24 months. Each program also delivers coursework asynchronously and offers students the option of completing their degree without ever visiting campus. That said, the secondary education program offers a blended learning pathway. Each program requires a minimum undergraduate GPA of 2.75 from all applicants. The elementary education program requires GRE or MAT scores while the other two do not. SEMO is regionally accredited by the Higher Learning Commission (HLC). Founded in Williamsburg, Kentucky, the University of the Cumberlands went through many iterations before settling on its current form. The school’s first graduate degree was actually an M.Ed., awarded in 1988. Today, the school offers two different master of K–12 education programs online: the aforementioned M.Ed. and a master of arts in teaching. While the M.Ed. program offers possible school counseling, literary specialist, and teacher as leader certification, the master’s in teaching program offers the following concentrations: elementary education, middle grades education, secondary education, K–12 education, business and marketing, and special education. The master’s in teaching program leads to initial teaching certification, while the M.Ed. program does not. Both programs deliver all coursework asynchronously, do not list on-campus requirements, and take about two years to complete. The University of the Cumberlands is regionally accredited by the Southern Association of Colleges and Schools Commission on Colleges (SACSCOC). Located in the city of Morehead, Kentucky, Morehead State reaches students far beyond its borders through distance learning degrees. One such degree, the school’s online master of K–12 education program, offers a great deal of variety to future educators. In the program, students can choose between middle grades (grades five through nine) certification and secondary school (eight through 12) certification. The program functions as an alternative teacher certification program for students who did not major in education during their undergraduate studies. Students graduate with an initial Kentucky teaching license and a master’s degree in one of these content areas: math, French, Spanish, science, language arts, earth science, social studies, chemistry, physics, business, or biology. The 36-credit curriculum usually takes 18–24 months to complete and delivers coursework asynchronously. The program prefers applicants with a minimum 3.0 undergraduate GPA and satisfactory PRAXIS I or GRE scores. Morehead State is regionally accredited by the Southern Association of Colleges and Schools Commission on Colleges (SACSCOC). Based in Richmond, Eastern Kentucky University (EKU) also operates branches in Manchester, Corbin, Lancaster, and Hazard. The university caters to distance learners across the country through its collection of online programs, including three online master of K–12 education programs: a master of arts in teaching, a master’s in elementary education, and a master’s in middle grades education. Though each of the three programs awards a different nominal degree, they share certain features. All three require students to complete 30 credits (totaling 18–24 months), all three deliver courses asynchronously, and all three never require online students to visit any of EKU’s campuses. Transfer students may apply up to nine previously earned credits to any of these three programs. Courses in each program last for eight weeks, and each program provides a tuition discount to active duty military personnel. EKU is regionally accredited by the Southern Association of Colleges and Schools Commission on Colleges (SACSCOC). Located in the city of Magnolia, Southern Arkansas University (SAU) provides education to a region without many institutions of higher learning. The school also offers unique programs such as Game and Animation Design. Given the region’s relatively small population, SAU expands its enrollment through a slate of distance learning offerings, including an online master of arts in teaching program. This particular master of K–12 education program requires students to complete 30 credits, a process that usually takes two years. These 30 credits include 24 credits of online, asynchronous coursework and six hours of student teaching — which students can complete in their communities without visiting campus. All students choose a concentration in elementary, middle grades, or secondary education. Students must also complete an Arkansas history course to earn their initial Arkansas teaching license. Based in the city of Highland Heights, Northern Kentucky University (NKU) gained national renown for its law and informatics programs. NKU is also the newest member of Kentucky’s state university system. In recent years, the school made a push to expand its distance learning degrees and now offers its master of K–12 education program online. The education program requires students to complete 36 credits, which they can usually accomplish in two years. These 36 credits include core courses in research, leadership, and 12–15 credits in one of the following concentrations: early childhood education, learning behavior disabilities, moderate and severe disabilities, gifted education, reading endorsement, autism/applied behavioral analysis, ESL, environmental endorsement, or instructional computer technology. The program delivers all coursework asynchronously and does not require students to visit campus. NKU is regionally accredited by the Southern Association of Colleges and Schools Commission on Colleges (SACSCOC). Based in Spearfish, South Dakota, Black Hills State University (BHSU) previously functioned as a teachers college. The school continues that legacy by offering its online master of K–12 education program to distance learners far beyond the borders of the Mount Rushmore State. BHSU’s secondary education program — known as Project SECOND — focuses primarily on hands-on learning, requiring two practicum experiences and student teaching. The program delivers all coursework asynchronously and does not require students to ever visit campus. The program prefers applicants with a minimum 2.7 GPA and an undergraduate degree in mathematics, English, history, or science. The program’s curriculum includes unique courses such as South Dakota Indian studies and human relations. BHSU is regionally accredited by the Higher Learning Commission (HLC). During a master of K–12 education program, graduate students expand teaching knowledge by honing advanced skills in assessment, pedagogy, and classroom management. Many programs include core classes and elective courses, which let graduate students customize the degree around their interests. The electives may offer specialized training for elementary or secondary teachers or training that prepares graduates for administrative and leadership positions in education. Some graduate teaching students may complete advanced coursework in their teaching field, such as science, social studies, or math. Many master’s programs also incorporate a student teaching experience, which lets master’s students apply their learning in a supervised classroom setting. Master’s students should research potential programs with their career goals in mind. For incoming students seeking to continue to work in elementary or secondary education, a program that offers a concentration in their teaching field advances their professional knowledge. Students considering a career in administration, such as a school principal, may prefer a program that offers classes in educational administration. Master of K–12 education programs offer a variety of courses and concentrations, with some programs specializing in elementary education, secondary education, or educational administration. When researching programs, prospective students should review the curriculum to ensure a program fits with their professional interests and goals. Students study curriculum policies, how to design a curriculum, and assessing a curriculum’s accordance with teaching standards. The course prepares teachers to design a curriculum and allows future administrators to review curricula. Students study the theories behind learning evaluation methods and how to assess student learning. The course also covers the reliability of assessment methods and how to compare different types of assessment, such as multiple-choice exams, essay tests, and project-based assessments. Master’s students study theories of how students learn. They may also study how to apply learning theory in classroom teaching. Students learn different strategies to manage a classroom, with different approaches for elementary, middle, and high school classrooms. The course may include theories behind classroom management, research on management strategies, and practical advice from experienced teachers. A master’s program may require a student teaching practicum. The experience builds hands-on skills, applying coursework from the graduate program to classroom teaching. Current teachers may be able to meet the requirement at their workplace. With a master’s degree, graduates qualify for a variety of K–12 education jobs. Many work as teachers and a master’s meets the requirement for a teaching license in every state. Most districts offer a salary increase for teachers with a master’s degree. A master’s also qualifies graduates for administrative positions, such as assistant principal or principal. Elementary school teachers instruct children from the ages of five to 11 in foundational subjects, such as math and reading. Most elementary teachers work with one class of students in a single grade, though they may also specialize in a subject, such as science or reading, and work with a variety of students. Teachers work in public and private schools, preparing materials and grading outside of school hours. High school teachers specialize in a subject area, such as math, science, social studies, English, or a foreign language. They design lesson plans, instruct students, and grade assessments. High school teachers may work with students in different grades, or teach honors or advanced classes. Principals oversee the daily operations at a school, monitoring the administrators, staff, and teachers. They set goals for the school, ensure the curricula meet standards, and manage finances. Most positions require a master’s degree and some experience as a teacher.